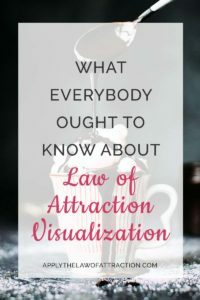 You've probably heard how visualization is a key part of Law of Attraction success. “You have to visualize your desire to attract your desire.” But what you don't hear is that Law of Attraction Visualization success depends on correct application of Law of Attraction visualization techniques. Law of Attraction visualization techniques aren't like your ordinary meditation or visualization techniques. Law of Attraction visualization is more than just using your mind to create a mental image of you realizing your goal. It isn't seeing yourself up on a movie screen. It isn't thinking “about” your desire. It isn't about mind energy at all. Law of Attraction Visualization is about your heart…and using heart energy to create. You aren't watching a picture from the outside. You are living the experience as if it was as real as you are now, as real as the screen on which you are reading these words… It's as if your visualization is your only reality. Or imagine sitting in front of a fire with a warm cup of hot chocolate in your hands. Feel the heat of the cup as you hold it. Hear the crackling of the fire. Feel the heat coming off the fire place. Bring the cup up to your nose and breathe in the delicious smell of the chocolate. As you take a drink, feel the chocolate hit your lips, drift seductively over your tongue, and flow warmly down your throat. Smile as you look over at your family planning tomorrow's skiing trip. Listen to them laugh. Immerse yourself in the scene. Think from your Law of Attraction visualization. Go beyond just having something. See how you would use it. See what it would allow you to do. Really experience the moment. Feel at one with the vision. Give it a lot of love. Enjoy it and really take it to the next level. Stay connected to it. Let the Universe make it happen. Just enjoy the ride. I’m glad you enjoyed the meditation video. It’s amazing how fast it works! Hey, just found your site. It’s great. Thanks also for the video on manifesting meditation. Great pics! And, the power being the words is amazing. Thanks Rob! I’m glad you like the site and video. The pictures always bring me fond memories of my time in Ireland. One night I visualized a relationship that I wanted with a specific person. I also told myself that I am open to this person or any person who would make me feel this way. I got so wrapped up in it that it lasted for an hour and a half with no breaks. And then later that I night, when I fell asleep, I had a dream about it the exact same way I visualized it. Then night after night, my dreams became a continuation of my visualization. Its almost like I cant wait to go to sleep. What I want in my real life is now in my dreams, I don’t even have to visualize it anymore to feel it because it feels more intense in my dreams. I am close to this person, it hasn’t progressed any, but he keeps in touch. What is happening here? How did this happen? 1) Are you taking any action to manifest your desire? 2) Do you prefer living in your dream than in reality? If so, be careful that you don’t only create your desire in your dream. Practice living as if it’s already happened when you’re awake too. 2.) I definitely don’t prefer my desires to be in my dreams instead of my reality. Where I want them to be is in my physical world. It’s just nice to have it show up in my dreams w/o me having to consciously think about them. It pops up on its own the way I want without me controlling it. How can I make it happen in my reality too? 1.) And I’m not sure how I should take action. I read your book but maybe I’m still confused. Do you mean I should call them? I don’t think that’s a good idea right now. I feel like in the past everytime I contacted this person, I did it out of desperation and focusing on how they werent here with me– that has given me very bad, and most often, subpar results so I’d prefer not talk to this person at the moment, for my own good. What other actions do you speak of? You’re right that acting out of desperation and focusing on how they weren’t with you usually produces bad results. There are tips on actions to take in my book in the section on getting your ex back. You still want to do these when you’re not acting out of desperation, etc. So if you think you’re coming from desperation or a negative place, it’s best to wait until you’re in a better place. 1. Setting your table for 2 people – put out two place settings, light candles, etc. Even have a conversation as if they’re there and imagine they’re talking back to you. 2. Do the things you would do if it had already happened – if you’ve been wanting to take a class or a trip but have been putting it off until you’re with the person, do it now. 3. The things that happen in your dream – act as if they’re happening during the day when you’re awake. I have been doing visualization upon wake and right before bed for 7 mins each time a lil over a week. The first few days I literally had a love affair with the visualization. So much so that I was saying ‘thank you’ , ‘i love this’ and ‘am so relieved’ thru out each visualization as if I was there and my dream has been fulfilled. Recently, my visualization seem boring because am visualization the same thing over n over. Is it safe to move on to a new visualization for the same desire and/or add on to the visualization ? Is it possible that am feeling this way because the universe is working on my request? I kinda feel so. Thankyou for being so generous in replying to all the queries, i had a query about visualization. though things manifest as i visualize, it isnt exactly the same way i want. For example : i visualised my friend calling me( we werent on talking terms at that point) , few days later he did call, but the conversation wasnt as i wanted. Any guidance on this?how can i visualize better? It means that you still have some resistance somewhere about your friendship and you need to let go of it. You have to remember that you can not manifest things into your life unless you are in a complete and total place of happiness and freedom. You can not be doubtful, unsure, or negative towards the thing that you want. Like for instance, instead of focusing on the fact that your conversation did not go the way that you wanted it to (that’s you sending out a negative emotion about your interaction with your friend) focus on the fact that you are so happy that your friend called. Think optimistically about your friendship and that you are excited about the beginning of a rekindled relationship. Remove your fear or doubt, you cant have what you want until you find that peaceful place. I have been doing visualization to manifest. I have always had a hard time with picturing people in my mind the way they actually look – even my own mother. But yet I know it is my Mom, or whoever. I was wondering does that matter? As long as I know who the person is does the fact that they way they look in my visualization is slightly different than how they really look in every day life? The feelings matter more than the images, so it’s okay if you have trouble with the images. I need a bit of help. Lately when I have been visualizing random negative thoughts “pop” into my mind. If I stop visualizing and change the thought to the positive, every time I visualize the negative thought “pops” in. If I ignore the negative thought and keep visualizing, they stop. I know with LOA you are supposed to change your thoughts right away because obviously you don’t want to create the negative thing. I am not sure what to do????? Because if I ignore those thoughts that “pop” in they go away, but I don’t want to create the negative thing. What should I do? Please help, this is driving me nuts! I see what you mean. There isn’t any need to be perfect. If I am understanding correctly, from both articles, I should just relax and when that happens stop fixating on it, just ignore it and let it go? I was reading over the various comments and had what I guess you would call an “ah ha” moment. I would love some input from you on this. Another person mentioned how they had negative thoughts come into their mind while visualizing and your reply was to just ignore that so that you are feeding the positive. I am working to overcome resistance – namely fear. I have been working on letting go of fears. When I read the comments on the post above it hit me that perhaps just ignoring the fears would help let them go. I would like to note that what I have been doing is EFT, but also when a fear pops up saying I let this go. After reading the comments it occurred to me that by focusing on the fear, saying stuff, I was actually fixating on it and making it worse, leading to other irrational fears that are meaningless. I decided to try it and I just ignored the fear, yeah it made me a bit anxious, but I pushed it into the back of my mind and was surprised to find it dissolved after a few minutes of me ignoring it. I actually told myself that the Universe knows what I really want to create, I trust that the fear won’t be created, and just stayed focused on other things until it passed. You’re right that fixating on the fear creates more fear, and can create the very thing you fear. Letting go involves trusting that only the good things you want are created, not the fear. If you’ve let go, fear is gone because you aren’t attached to the outcome and are now trusting the Universe. I have been trying for awhile to overcome the resistance, it is amazing what happens when you have an “ah ha” moment and realize wait a minute just ignore it. I finally feel able to keep my focus on what I really want. “Ah ha” moments really are amazing, aren’t they? I’m so happy for your success! Yes they are amazing! Thank you I am happy about it too. I did have a bit of an issue when I woke up today but I just ignored the fear and doubt, and instead said a few of those love affirmations you posted. Just really focused on what I want instead. Worked like a charm and I am grateful for that! I know I posted earlier, but wow I just realized something. I realized that part of letting go of the outcome and trusting the Universe, is also trusting that despite the fears that come up, the Universe knows my true desire. A bit of background there, most days my focus is more on my desire, rather than fear. The signs I get are good too. What I realized is part of letting go, trusting the Universe means also trusting that those fears, won’t be created. Am I correct regarding that? Thank you again, sorry for more than one post. Just excited. You are correct that that is part of letting go. I have a question about visualization. I have a hard time visualizing within my thoughts. Instead I have been putting my love interest within my life. Pretending we are eating together or talking to each other while making dinner. That kind of thing. Is that an ok way to visualize for LOA? That is a good form of acting as if that can help you achieve results with the Law of Attraction. Hope you are good. I posted several weeks ago on a letting go post and another about signs. Funny note there, even though I have still been overcoming resistance I am still seeing butterflies all the time. Awesome I see that as my special sign from the Universe. I was reading over the comments on this post and noticed a few comments relating to letting go. Want to update you first, I am now almost completely rid of all the deeply embedded “resistance” and am so much happier and trusting. While reading the comments here on the visualization post, I noticed other comments about letting go and trusting that only the good things are being created. One of the final things I am letting go of is sometimes I have thoughts of worry or upset because overcoming what I have I really had a lot of fears and what not. Then I saw the comments above and you mentioned that part of letting go is trusting that only the good things are being created. I know the Universe knows of my efforts, good days, bad days on my journey of overcoming embedded resistance, but there has been that last bit and after reading the comments I was wondering do you think that would work for me? Just ignore that last bit and instead just fully TRUST that even while overcoming so much only the good things I want are being created? Thank you again Elizabeth for your time helping so many. Hi PJ – I’m glad you’ve made so much progress. Fully trusting that only good things are being created is a vital part of the Law of Attraction. Not trusting is a sign of resistance, so the more you allow yourself to trust, the less resistance you should have. Oh wow I think I get it. You mean it is trusting that even while I was working to overcome the resistace it is just trusting the Universe knows I made a commitment to overcome and let go. The Universe loves me and supports my efforts. And trusting despite what I was going through involving fear etc just trust that only the good is created so just let go of the last of it and focus on what I want? Is that right? Yes. At all times, no matter what you are going through, trust that only good is being created. Just let go and focus on what you want, allowing it to be created, trusting that it is already yours. Wow Elizabeth I read your post and I feel as though it is a direct sign to me from the Universe based on some of the things you said. Just the way you worded it won’t go into details but wow! I read it and just knew the Universe was talking through you. I am so grateful! i guess where i struggle with the LOA is where is the line between trusting and letting go, but than doing action? would the action part be fueling resistance because you are focusing to hard on the outcome? I really enjoy reading your articles on this website. I read also your book on how to attract the specific someone. Just to make sure, I absolutely know that it DOES WORK and support that. I just would like to know whether you recommend to use both versions of visualization. The scripted version at morning and at evening, and the “normal”visualization? Or simply the scripted visualization. After all it is all about the FEELINGS right? One more question concerning acting as if. It seems sometimes too crazy doing it, and would make me focus after some time more on the lack of things, persons, circumstances. But I guess it is also about finding out what works for one in order to create strong positive feelings, and continuing with those and neclecting all others. Elizabeth says below that she no longer responds to individual comments. I had a question, so I heard of this process called the 68 minute visualization. Is anyone aware of that? I heard that if you visualize for 68 seconds, the world beings to shift and manifest what you want. So, should I visualize for 68 seconds every day with clear thoughts? How exactly does the process work? Does anyone know?